KSTP-TV/FacebookPresident Donald Trump boarding Air Force One on Thursday. A thin piece of paper that resembled toilet tissue or a napkin was stuck to President Donald Trump’s shoe as he boarded Air Force One on Thursday. When Trump reached the top of the stairs, he turned back and waved to the crowd. The paper got dislodged as he entered the cabin. Four other people walked up the steps after Trump. The last person spotted the cloth and picked it up with his hands. 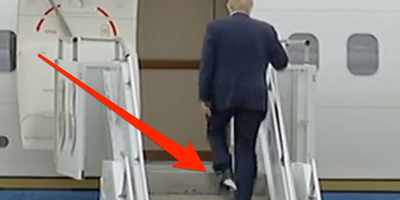 President Donald Trump boarded Air Force One on Thursday with what appeared to be toilet tissue or a napkin stuck to his left shoe. Video cameras captured Trump walking up the stairs to the aircraft at the Minneapolis-St. Paul International Airport. When he reached the top of the stairs, he turned back and waved to the crowd. The paper got dislodged as he entered the cabin. The president was travelling to the Mayo Civic Center in Rochester, Minnesota, for a campaign rally Thursday night. Speaking to a crowd of about 10,000 people, he endorsed several Republican candidates who are running for office.